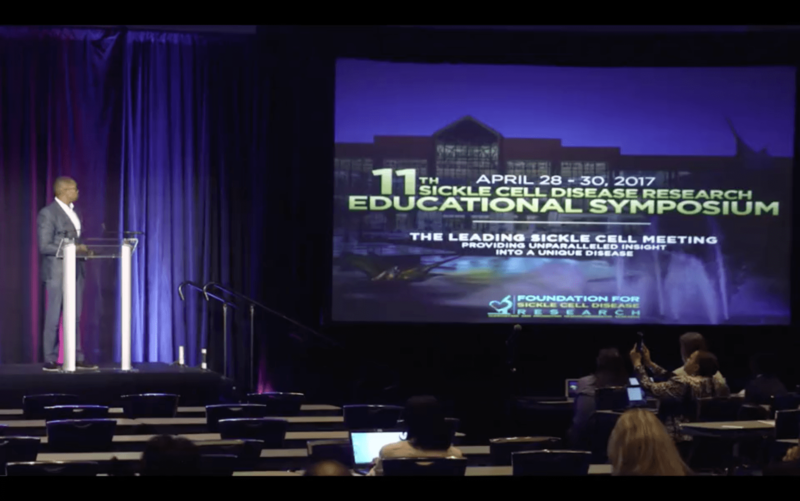 The vaso-occlusive events in sickle cell disease (SCD) begin in early childhood, warranting the need for more preventative and therapeutic interventions for those affected. Vaso-occlusion is partly caused by adhesion of sickle erythrocytes (SSRBCs) to components of the vascular wall and to circulating leucocytes (WBCs). SSRBCs have greater adhesion to the vascular endothelium and sub-endothelial matrix (SEM) compared to RBCs from unaffected individuals. Very late antigen 4 (VLA-4, ITGA4) or α4β1 integrin is one of the most characterized molecules investigated for its role in these adhesive interactions. VLA-4 is the only integrin maintained on the surface of young SSRBCs and reticulocytes, which are increased in the peripheral blood of SCD patients. VLA-4 mediates SSRBC adhesion to the endothelium via vascular cell adhesion molecule 1 (VCAM-1) and to the SEM via fibronectin. SSRBC-WBC aggregate formation is promoted by fibronectin bridging of monocytes and reticulocytes via their surface VLA-4 during flow (Brittain et al, 2008; Chaar et al, 2010). These hetero-cellular WBC-SSRBC aggregates contribute to vascular obstruction in SCD (Turhan et al, 2002), resulting in local hypoxia, increased HbS polymer formation and propagation of vaso-occlusion.VLA-4 blockade by monoclonal antibodies has been used to treat pathological inflammation in multiple sclerosis and Crohn Disease. Low molecular weight heparins (LMWHs) have been recently shown to exhibit VLA-4 inhibition in a human melanoma cell line during physiological flow (Schlesinger et al, 2009). VLA-4 inhibition as a therapeutic strategy for SCD has not been explored. Peripheral blood was obtained from patients with homozygous SS SCD (n = 12). Patients provided informed consent. SSRBC adhesion to VCAM-1 was evaluated during standardized physiological flow conditions (1·67 Hz, 1·0 dyne/cm2) with a Bioflux microfluidic flow system (Fluxion, San Francisco, CA, USA), as previously described (White et al, 2015). To evaluate SSRBC/WBC interactions in whole blood we adopted a two-colour flow cytometric assay (Brittainet al, 2008). 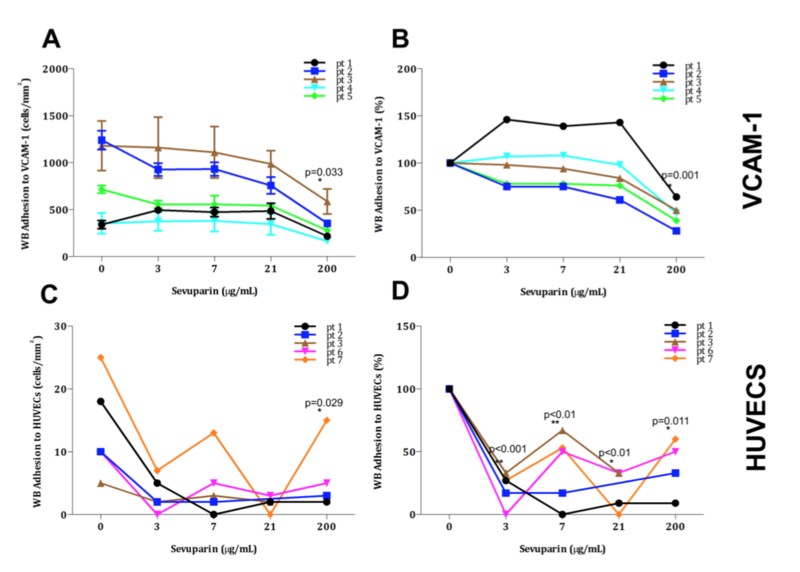 SSRBC/WBC interactions were detected with a fluorescein isothicyanate-conjugated antibody against the RBC specific antigen, CD235a, and an allophycocyanin-conjugated antibody against the leucocyte-specific antigen, CD45. The percentage of events that were positive for both antigens suggests that an interaction between these two cell types existed. Acquisition and analysis was performed using a BECK-Coulter XL-MCL flow cytometer equipped with an argon laser (Brea, CA, USA) via System II software. P-values ≤ 0·05 were considered statistically significant. VLA-4 exists in various conformational states. The high affinity binding state of VLA-4 facilitates cell adhesion, and previous studies show this high-affinity state can be experimentally induced by manganese (Ye et al, 2012). SSRBC adhesion was measured during physiological flow in the absence/presence of 1 mmol/l manganese (MnCl2). Manganese significantly increased baseline adhesion to VCAM-1 (12·9-fold ± 5·37, P = 0·002; Fig 1A). The extent of stimulation varied from patient-to-patient (1·5- to 63·4-fold; Fig 1A). SSRBCs were then pre-treated with an anti-VLA-4 antibody (HP2/1). HP2/1 decreased adhesion to VCAM-1 (0·74-fold ± 0·10, P = 0·02; Fig 1A). Baseline adhesion correlates with the extent of manganese-stimulated adhesion to VCAM-1 (r = 0·75, P = 0·01; Fig 1B) and circulating WBCs (r = 0·61, P = 0·04; Fig 1C). LMWHs, enoxaparin and fondaparinux, inhibit manganese-stimulated SSRBC adhesion to immobilized VCAM-1 (0·43-fold ± 0·08, P = 0·03 and 0·50-fold ± 0·14, P = 0·046 respectively; Fig 1D). Similarly, manganese stimulated SSRBC/WBC aggregates in whole blood (2·2-fold ± 0·59; Fig 2). LMWH reduces SSRBC/WBC aggregates. Manganese stimulates sickle erythrocyte (SSRBC) adhesion to vascular cell adhesion molecule 1 (VCAM-1) during physiological flow through a VLA-4 mediated pathway; Low molecular weight heparins (LMWHs) disrupt VLA-4/VCAM-1 interactions. SSRBC adhesion to VCAM-1 was measured during physiological flow. (A) Manganese-stimulated SSRBCs were pre-treated with an anti-VLA-4 antibody (HP2/1) to confirm that VLA-4 mediates adhesion to VCAM-1. The effect of manganese and manganese-HP2/1 on baseline adhesion to VCAM-1 was measured. (B, C) Baseline adhesion correlates with the extent of manganese stimulation and the level of leucocytes (WBCs) in circulation. (D) The effect of LMWH on SSRBC adhesion to VCAM-1 was evaluated. Manganese-stimulated SSRBCs were treated with LMWHs (enoxaparin and fondaparinux). Adhesion was measured during physiological flow. Manganese stimulates SSRBC-WBC aggregates in whole blood; LMWH disrupts SSRBC-WBC interactions in whole blood. Flow cytometry was used to characterize aggregates in whole blood before and after manganese stimulation and in the presence or absence of LMWH. CD45+/GlyA+ aggregates were classified as leucocyte/erythrocyte (WBC/RBC) aggregates respectively. LMWH, low molecular weight heparin; SSRBC, sickle erythrocyte. Heparins decrease the duration and severity of vaso-occlusive events in SCD (Shah et al, 2013), the mechanisms by which are not completely understood. This may be possible through heparin blockade of adhesion of SSRBCs to P-selectin (Koenig et al, 1998). Heparins also have anti-VLA-4 activity (Schlesinger et al, 2009). This study provides the first evidence for the role of LMWHs and other heparins as anti-adhesives in SCD due to their anti VLA-4 activity. The observed patient-to-patient variability in both baseline adhesion (9–269 SSRBCs/mm2) and stimulated adhesion (52–598 SSRBCs/mm2) to VCAM-1 has been previously described (Whiteet al, 2015), and probably reflects the differences in cells expressing VLA-4, and the density of VLA-4 on the surface of individual RBCs/WBCs. SCD is a pro-inflammatory condition, reflected by elevated levels of cytokines and leucocytes in peripheral blood. Cytokines shift VLA-4 to an active, high-affinity state (Askari et al, 2009). For our study, we utilized manganese, an experimentally accepted method for direct integrin stimulation (Ye et al, 2012), to induce VLA-4 to its active state. We found that the patient samples with greater SSRBC adhesion to VCAM-1 corresponded to the patients with higher WBC counts (Fig 1C). Patient samples with the highest baseline SSRBC adhesion to VCAM-1 had the greatest response to manganese stimulation (Fig 1B), suggesting a theoretical risk of vaso-occlusive complication induced by stimulated adhesion in patients with higher baseline adhesion levels. Reticulocyte count was not found to be significant (data not shown). Previous studies have shown that fibronectin can mediate WBC-SSRBC interactions (Brittainet al, 2008). Heparin and heparin-like molecules have been shown to interfere with cellular interactions mediated by fibronectin (Bendas & Borsig, 2012). Our study demonstrates that LMWH decreases WBC-SSRBC interactions in vitro (Fig 2). This is likely due to inhibition of fibronectin bridge formation and VLA-4/LuBCAM interactions. There is extensive clinical experience with the dosing and safety profile of enoxaparin in the paediatric population. LMWHs are easy to administer at home and do not require intravenous access. Our work provides the first evidence that LMWHs can inhibit SSRBC adhesion partly through blocking cellular VLA-4, and suggest that the improved clinical outcomes experienced by patients treated with LMWH during vaso-occlusive pain crises may be partly due to VLA-4 inhibition. LMWH, as well as targeted VLA-4 inhibition, should be explored as a therapeutic option in SCD. ML: Project conception, patient recruitment, experimental design and execution, data analysis, manuscript preparation. JW: Patient recruitment, experimental design and execution, data analysis, manuscript preparation. SS: Patient recruitment, clinical guidance, manuscript preparation. PH: Funding, clinical protocol preparation, experimental design, data analysis, manuscript preparation.